The Almond Tree (Prunus amygdalus), a member of the Rose Family, is a small bushy deciduous tree native to western Asia and North Africa. The highly prized edible nuts are actually the seeds of a plum-like fruit, and as a matter of fact the plant is related to plums and peaches. They are cultivated in southern Australia and California, and they occupy more farming area in California than any other crop except grapes (about 400,000 acres). California produces 80% of the world's supply of almonds. It takes more than 1.2 million bee hives to pollinate California's Almond crop (over 550,000 acres). Chocolate manufacturers currently use 40 percent of the world's almonds and 20 percent of the world's peanuts. Historians generally agree that almonds and dates, both mentioned in the Old Testament of the Bible, were among the earliest cultivated foods. Almonds are one of only two nuts mentioned in the Bible (Genesis 43:11) the other is the pistachio nut. The world's largest almond factory is in Sacramento, California. It processes 2 million pounds of almonds a day. The Jordan almond is a large plump variety of almond from Malaga, Spain, considered to be the finest cultivated almond. The are frequently sold with a hard colored sugar coating, or salted. Almonds are the most nutrient-dense tree nut. 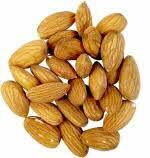 One ounce of almonds (20-25 almonds) contains 160 calories and only 1 gram of saturated fat and no cholesterol. Almonds are also an excellent source of vitamin E and magnesium, and a good source of protein and potassium. The protein in almonds is more like the proteins in human breast milk of all the seeds and nuts, which is why it is the choice of the Canadian College of Naturopathic Medicine as the base for its baby formula.